This year I turned 40. Ouch. I’ve been alive for a long time. Because I have generous friends and wives, I was given a few 1970 bottles of wine for my birthday (this was many months ago). When I get bottles like these, my instinct is to hoard them away in the wine cooler and save them for years - but I made the decision that I would drink them this year, partly because one of them needed to be drunk sooner than later and I also didn’t want to wait until I was (Xenu forbid) 50. Or 60. Or 70. My plan for this year and these 1970 wines are to drink them with people who also just turned 40. Saturday night we were invited over to a friend’s new apartment for dinner. This friend, we’ll call him Jeff, also just turned 40 and is one of my oldest friends (we met on the first day of college (there’s a funny story there that I won’t share online)). As a sidenote, I’ve become more proactive in identifying special occasions. 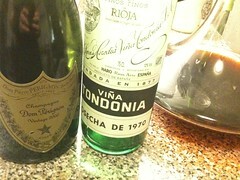 Saturday night, after a bottle of Dom Perignon 2000 (oh, darn), we opened my 1970 López de Heredia Vina Tondonia. If you aren’t familiar with this producer and wine, here are some quick notes. Lopez de Heredia is the producer. 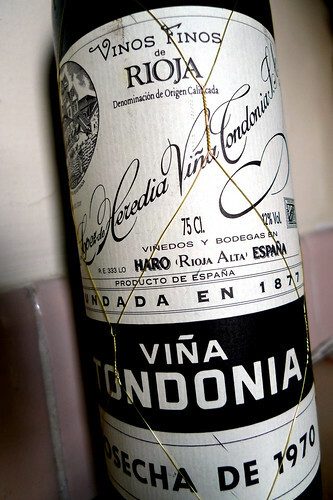 Their main and famous vineyard is Tondonia and is located in the Rioja region (Rioja Alta to be specific) in Spain. The grapes used for their red wines are the regular cast of characters that you find in Rioja: Tempranillo (the primary grape), Garnacha, Graciano and Mazuelo. Note that Graciano and Mazuelo would both be good names for a pet or child. 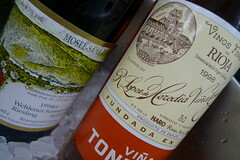 I discovered Lopez de Heredia a few years ago when I started buying their rosé. It’s a crazy wine that is probably not for everyone (my lovely wife doesn’t really love their rosé). The ‘crazy’ aspect is that they let their wines age way past what their competitors would do; for example, their newest rosé is a 2000. This extra time ageing along with their winemaking techniques gives their wines an extra level of complexity that you don’t get in your normal young wines. 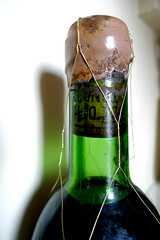 The 1970 was, first and foremost, easy to open. When opening old wines, I often have issues getting the cork out as they can become overly soft and crumbly after a long time. I need one of those nice ‘spanner’ type openers. I did have to chip away at the pretty hard wax they use to cover the capsule, but once the wax was cleared away, the cork came out without any issue. The color of the wine was beautiful. It was this great reddish coppery color that looked stunning in a glass. The nose had the strong nutty, oxidized notes that you’d recognize if you drank any of their other wines (smelled like Sherry) but on the palate there was still a lot of fruit and the general balance on the wine was great. It was pretty perfect: it had the notes of ageing that dorks like but still had fruit and balance that normal people like. We had a big bowl of mussels with tomatoes and pasta. It paired well. For dessert, there was a chocolate mousse and what we had left went even better with that.